I haven’t finished embroidering the hummingbirds. I haven’t finished hemming the redwork runner. I haven’t finished the Stitch Sampler Alphabet e-book. But I have, regardless of the other prioritized items on my To-Do List, been sneaking in some stitches on Late Harvest. I keep an itemized To-Do List, and every night, I prioritize the next day’s activities. I also keep a Project To-Do List, on which are all the projects I should be working on, arranged by priority as well. Late Harvest is at the bottom of the list. But really, what’s a gal to do? Ever since I set up the project, I’ve had a blank canvas there, just waiting, waiting, waiting. And every time I go out to do some real work, it looks at me, pleading. Put some stitches on me! Put some stitches on me! I couldn’t just ignore it, could I? 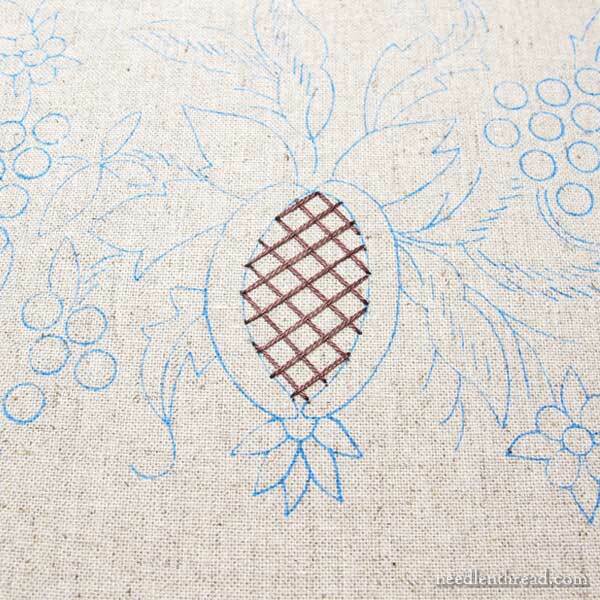 So, the first step in the project is the central pomegranate, and the middle of it is worked in battlement couching. I love battlement couching! And if you try it, you’ll probably like it, too! I have a step-by-step tutorial for battlement couching right here. It’s easy, it can be colorful and fun – it’s a neat filling technique! What I really love about the battlement couching on Late Harvest is that it is couched with tiny seed beads on the couching stitches. What I didn’t notice when working it was that I pulled the top layer of laid stitches with every couching stitch I took. I’m not sure of two things: why that happened, and why I didn’t see it at the time. I didn’t notice it until I looked at the photos. So, I went out and looked at it again, with just my eyes. And I thought about it a bit. I thought about taking it out. And then I thought about leaving it in. And while I was contemplating these things, I decided to put some more stitches in. Why stand there doing nothing but thinking, after all? 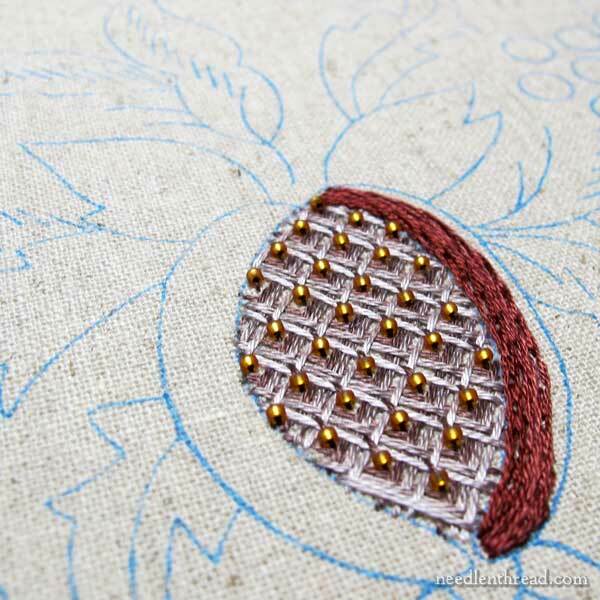 So I started adding the stem stitch padding around the pomegranate, at which time, I concluded that I would not take out the battlement couching. The stem stitch here is worked rather quickly and not super neatly – it is simply padding for some stitches that will go over it. And while you can see some gaps right now on the very edges of the battlement couching, once the outer skin of the pomegranate is finished, those won’t be noticeable. Now, I was going to stop there until I reached a goal (like finishing the hem on the redwork runner, finishing the rest of the wing on the hummingbird, finishing the re-organization of some spots in my workroom), but suddenly, looking at the photo above, I feel sorry for the pomegranate. It looks cold and naked. It needs skin. Gosh darnit, it’s winter, after all! I think I’m going to have to work on my prioritization skills. I seem to be confused about the meaning of the term. Either that, or I need to start putting the more urgent items at the bottom of the list. October 1, 2014 Crewel Intentions: Winner! I just didn’t watch closely where I was placing the stitches. I think going up a little higher over the last layer – taking the couching stitch a little higher than you think you need to – would eliminate that. Hurray! We’re off on another adventure!! Hihihihihihi. Sudden l feel sooooooo much better!!!!! Thanks Mary for making my day. I thought that I as living on this special island called Ceding to Embtations all by my lonely little self! Hihihihihihi. This is exciting! I will be working along with you on this project. I have yet to set it up because I am indecisive about whether to press the ground fabric (from the back or with a pressing cloth) before putting it onto the frame. There are some serious creases where the fabric was folded for packaging. Will the “stretching” into the frame and the spraying to tighten it up eliminate the creases? You can press it – it won’t hurt it. But mine was creased, too. I just mounted it on the frame, stretched it, and sprayed it. The creases are gone! I don’t blame you at all for starting on this. When I look through Hazel’s book, the battlement couching is one of those techniques that looks so complicated and like something I just have to try. I reviewed your tutorial for the stitch and suspect I’ll be back there to read through it again. But very nice effect. Thank you for sharing. Tut tut tut. You’re half like me! Except I would do that and then never get round to doing the “high priority” stuff. Thanks for the smile. I should learn Battlement Couching. It looks fun and useful. Another one on that “To-do List”! You obviously required a New Start. Is there an issue? What issue would that be? I suppose I could have couched the top laid stitch separately, and then, in the center of the square, added the bead. That would probably eliminate it. But I’m not really bothered by it. The funny thing is, I’m rarely bothered by small misplacements when I’m working a kit. If I were working my own project, it would have bothered me. This is a technique I am unfamiliar with, but now having seen it, have the perfect place to use it on one of my needlepoint canvases. Thank you for putting up this post, Mary! Off to stitch! Mary — Pablo Picasso once said “Only put off until tomorrow what you are willing to die having left undone.” — However, he didn’t explain how to do everything today that we don’t want to leave undone. And if you’re like most of us, we keep adding to that list each day more than we actually cross off the list. It seems to be a lot of fun ! Your battlement stitch looks fine to me I can’t see where you pulled the stitches. I know what you mean about wanting to start a new project which is lying there waiting to be stitched itching to get started. I’m sure you will get to finish all the other projects in time especially the alphabet e-book which I can’t wait to see. Thanks for sharing your confessions and for showing us your the start of your new project. Good luck with finishing the rest of your projects and I hope you get to re-organising your room. Sometimes the best laid plans…Just enjoy the process. You’ll come to a resting point soon when you can resume the other projects. I’m likin’ the colors there! It’s okay, Mary, to hop around a bit with the projects. All of us needleworkers do it, I’m sure, and it could get dull following only one project at a time. Beautiful! That would look great as wing on an owl (which is what I thought when I saw it). I love the lattice type stitches and incorporate them into some of my smaller projects. The addition of the bead gives it a nice sparkle and more dimension. You inspire me so much. My work may never be as gorgeous as yours but it does inspire me to try new stitches and have fun with the project. I have no good advice for you on prioritizing, except maybe to not do what I do! But I strongly identify with all your confessions, especially the reorganization. Are you kidding??!! Always work on the inspiration project! While you’re inspired. I don’t follow this advice all the time either because I’m one of those people who only likes to have one or two projects going at one time. But I do think it’s a good rule of thumb and I’m trying to incorporate it better into my priorities, instead of being such a stickler. If you’re truly inspired, I think you’ll be more likely to finish the project than forcing yourself to work on the other. Of course then you have to go back and finish the others at some point. You’re lucky; you have all of us to keep your on task. (??) Are we doing a good job??? (I don’t know about that) 😀 Have a great day! This post makes me smile so much! I think we all understand. Your work is gorgeous as always. Thanks for taking us along on your journey! Hi, Mary! I’ve thought about a support group to start, of which I would be the first member. It’s acronym would be SSA, for Serial Starters Anonymous! I am certainly guilty of this – the lure of the new project is always is a siren song. Would anyone be interested? beautiful work – i am looking forward to see your progress on this project as i am working another one of Hazel’s designs. your raised stem stitch tutorial was very helpful. I feel like you do all the time, but it’s beautiful. I was also wondering why I am no longer receiving your daily newsletter. Is it a bug on your end or mine. Just wondering. I still have been looking at your web site anyway. I’ll check on that, Nora! Thanks! I for one am happy happy happy to have you share your stitching with us – it seems like forever since we had such a juicy progress report. I bet Late Harvest will be as much fun for us as it will be for you. Also, your last paragraph was super funny and totally in tune with my style of prioritization. Mary, Mary, Mary, you know that you can’t set up a project and then not put a single stitch in it! It goes against all the laws of nature and I. Sure it’s actually illegal in some cultures…mine for instance. Must try the prioritised list daily, even though it obviously doesn’t work that well. What we need is a finisher offerer! Been there, done that! I’ve got about a dozen ‘in process’ pieces because starting a new one is so great! (Tuesday, January 4, 2011 Free Hand Embroidery Pattern: Pomegranate Corners) which I bookmarked as a site for you on my computer. Maybe your battlement couching embellished with beads will be some playful treasure when my other deadlines are accomplished. Thanks, as always! Oh my goodness, by this confession, are you saying that you are human? Oh, yeah! And then some…. ‘To do’ and ‘project action’ lists. What can I say? You are clearly a person after my own heart and I suspect many others besides…… just makes actually finishing projects all the more significant and cause for a MAJOR celebration. Occasionally I just LOVE to do what I want in the moment I want to do it …….it’s the best fun (Like reading this blog when I should be tidying up!) And then later I feel better about getting down to the items on the list. No harm done! This project looks like it’s going to be another stunning piece of work. Oh Mary, you have just tumbled from the pedestal upon which I had you perched as the paragon of virtue. Just kidding, I don’t blame you in the least. It’s always more fun and more exciting to start a new project than finish off an old one and this one looks so very enticing. I have noticed when using stem stitch as a filler that there are those little gaps. What should be done about that, if anything? I am working on fabric that is a pretty near match for the embroidery so I wonder if I need to fill in those gaps or just leave them? The piece is a freestyle contemporary design of my own devising. I really would appreciate your advice but I realise that asking may be a bit cheeky so it is entirely your decision as to whether you reply or not. Thanks for reading this far if you have, lol. Hi, Christine – the stem stitch here is more for the lift – the top is going to be covered with buttonhole. I wouldn’t worry about the gaps! Love the 3-D look. If the result of a “mistake” from pulling stitches, embrace it & rename as your very own stitch variation. Mary, I was admiring your battlement couching stitch I am working on a Jacobean project and having a hard time understanding the needle lace stitch that was used to fill a petal. Is this lace stitch a hard stitch to conquer ? I was debating using the battlement couching stitch, but not sure if that would work. Hi,Lynn – not sure what the stitch is – I’d have to look it up in the book. Do you have any more details? What project is it? Mary, it’s the Jacobean tangle project on pg. 83 in her Crewel twists book. It is the needle lace stitch and I went into your tutorial library and saw the detached buttonhole stitch and wondered if that would work. I am glad you are suggesting that. Sometimes I just can’t wrap my brain around some of these instructions that they have in these embroidery books ! Your tutorials are my savior. 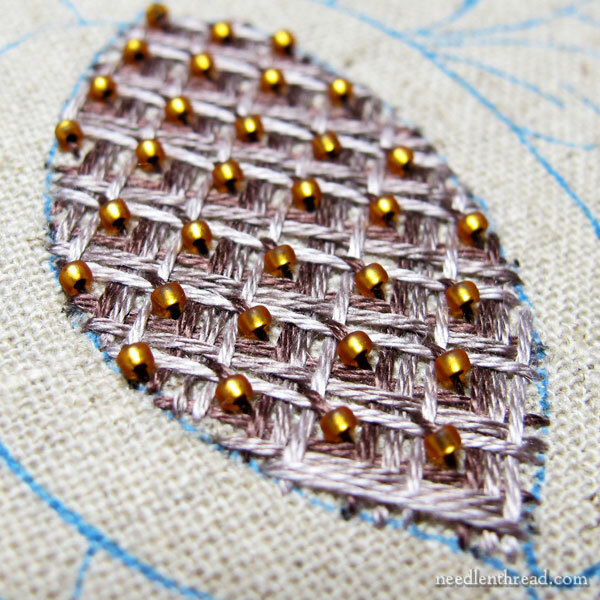 I love the combination of different stitches she uses in this project. I have to second this! I have several very good embroidery books, but, inevitably, I come here to see what Mary’s done with her video and photo tutorials–and excellent explanations–to better understand just what, exactly, I’m supposed to be doing! Mary, that’s how I prioritize. 🙂 It is a relief to know that someone of your stature does this, too. Next Next post: A Little News and a Winner!